If you lived at the Poles you would see the same stars throughout the year. However in the UK (between latitudes 50 and 60° north) we see circumpolar constellations, such as Ursa Major througout the year and some constellations, such as Orion, for a few months of the year. This is caused by the same factors that govern the the seaons on Earth. The Earth's axis is titled at an angle of 23.5° to the ecliptic. This results in us seeing some constellations throughout the year and some only part of the year. The amount of daylight also has an important part to play in this. Orion is visible from October to February in the night sky. It is in the sky in June but we can't see when it rises as it is daylight. By the time evening comes it is set whereas Ursa Major has not set, it is visible in the night sky. Circumpolar stars are stars that can be seen from one location throughout the year. Other stars are usually only seen for a month or two. They are stars that never seem to set below the horizon, so the nearer you are to a pole, the more stars you’ll see that are the same throughout the year, and the less seasonal stars. When you’re nearer the Equator you’ll see less circumpolar stars but more seasonal stars. Stars appear to revolve around Polaris in the Northern Hemisphere. As the Earth rotates stars appear to revolve around that star because it is above the Earth’s northern axis. 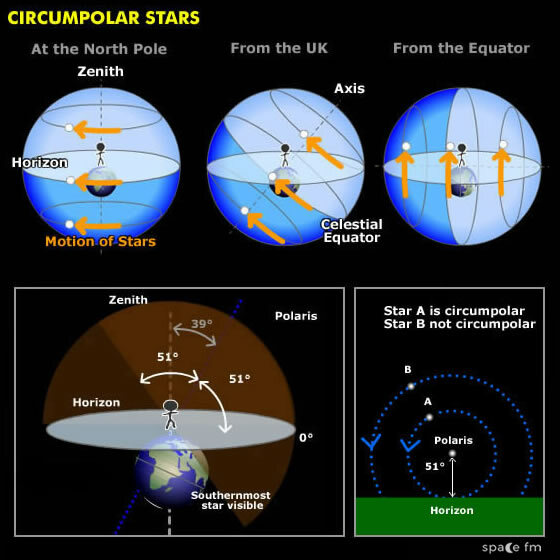 See the Culmination page about the upper and lower transits of circumpolar stars. A star reaches upper culmination when it is at the highest point in the sky. Example: Megrez (Ursa Major) has a declination of 57°. Our observer in London is at 51° North. 57 is greater than 39 so Megrez is circumpolar from London. Another way to do it is to say Declination > Co-latitude which involves the same mathematics = 90°-51° = 39°. 57°>39°. 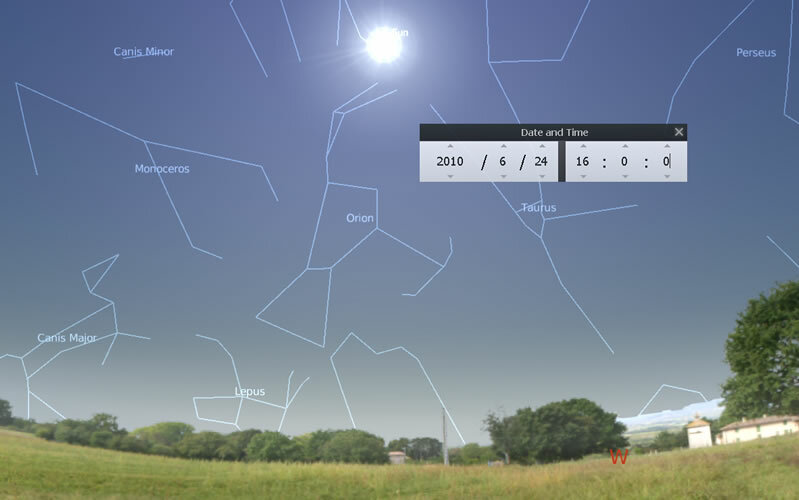 Curious about Astronomy Why do different stars appear with seasons?